Not to be confused with Keisei-Nishifuna Station. Nishi-Funabashi Station (西船橋駅, Nishi-Funabashi-eki) is a railway station in Funabashi, Chiba, Japan, operated by East Japan Railway Company (JR East), Tokyo Metro, and the Tōyō Rapid Railway. It is the eastern-most station of the Tokyo subway network, lying in Chiba Prefecture. Nishi-Funabashi Station is served by the following lines. The station consists of six island platforms serving eleven tracks on two levels (another two tracks are used by Sōbu Line (Rapid) trains which do not stop). The high-level station serves the Keiyō and Musashino Lines. The low level is served by the Sōbu, Tōzai and Tōyō Rapid Railway Lines. The low level can be subdivided into two sections, one served by trains running into Tokyo via the Sōbu Line and the other by trains running into Tokyo via the Tōzai Line, since all the track connections between the two lines are east of the station. Platforms 1 and 2 are for Sōbu Line trains for Funabashi, Tsudanuma and Chiba, and platforms 3 and 4 for trains for Kinshichō, Akihabara, Shinjuku, Nakano and Mitaka. Platforms 2 and 3 share the same track and are often used to terminate trains from Ochanomizu. Within the Tokyo Metro section, platform 5 is the main platform for Tōyō services to Kita-Narashino and Tōyō-Katsutadai, while the few trains from the Tōzai Line to Funabashi and Tsudanuma can also leave from here. Platform 6 is mainly used for terminating Tōzai Line trains (to Toyocho, Nihombashi, Otemachi and Nakano), although it is used for through services in peak hours. Platform 7 is mainly used for Tōzai Line trains (mainly for reversing them), and platform 8 is exclusively for Tōzai Line trains. The high-level station consists of platforms 9 to 12. Normally platforms 9 and 10 are used by Musashino Line trains (to Shim-Matsudo, Minami-Urawa and Fuchūhommachi), platform 11 is used by trains to Tokyo (via Maihama and Shin-Kiba) and platform 12 by trains to Minami-Funabashi, Shin-Narashino and Kaihimmakuhari. The station opened on the Sobu Line on November 10, 1958, initially serving passengers only. It moved into a new station building on December 15, 1968, when the line was quadrupled. 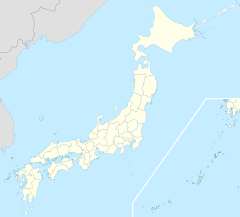 The Eidan Tozai Line arrived here on March 29, 1969, and through service between the two lines commenced. Freight services commenced on April 8. The high-level station opened on October 2, 1978, when platforms 9 and 10 (presentday 11 and 12) started being used as the terminus of the Musashino Line. On March 3, 1986, platforms 9 and 10 opened for use by the initial section of the Keiyo Line (from here to Chiba-Minato). Freight services ceased on November 1, 1986. The next part of the Keiyō Line (Shin-Kiba to Nishi-Funabashi and Minami-Funabashi) opened on December 1, 1988. At the same time, through services began between the Keiyo and Musashino Lines. The Tōyō Rapid Railway Line opened on April 27, 1996, with through services to the Eidan Tōzai Line from the first day. The Dila Nishi-Funabashi station building complex opened on January 15, 2005. In fiscal 2013, the JR East station was used by 130,814 passengers daily (boarding passengers only), making it the 25th-busiest station operated by JR East. In fiscal 2013, the Tokyo Metro station was used by an average of 279,770 passengers per day (exiting and entering passengers). Note that the statistics consider passengers who travel through Nishi-Funabashi station on a through service as users of the station, even if they did not disembark at the station. In fiscal 2011, the Tōyō Rapid Railway station was used by an average of 52,004 passengers daily (boarding passengers only), making it the busiest station operated by the company. The daily passenger figures for JR East and Tokyo Metro in previous years are as shown below. Note that JR East figures are for boarding passengers only. ^ a b 各駅の乗車人員　（2013年度） [Station passenger figures (Fiscal 2013)] (in Japanese). Japan: East Japan Railway Company. Retrieved 6 September 2014. ^ a b 各駅の乗降人員ランキング [Station usage ranking] (in Japanese). Tokyo Metro. Retrieved 6 September 2014. ^ 千葉県統計年鑑(平成24年) [11.運輸・通信] [Chiba Prefecture Annual Statistics (2012) [11.Transportation and Communication]] (in Japanese). 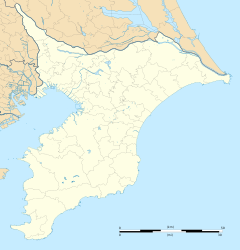 Chiba Prefecture. Retrieved 6 September 2014. ^ 各駅の乗車人員　（1999年度） [Station passenger figures (Fiscal 1999)] (in Japanese). Japan: East Japan Railway Company. Retrieved 6 September 2014. ^ 各駅の乗車人員　（2000年度） [Station passenger figures (Fiscal 2000)] (in Japanese). Japan: East Japan Railway Company. Retrieved 6 September 2014. ^ 各駅の乗車人員　（2005年度） [Station passenger figures (Fiscal 2005)] (in Japanese). Japan: East Japan Railway Company. Retrieved 6 September 2014. ^ 各駅の乗車人員 (2010年度) [Station passenger figures (Fiscal 2010)] (in Japanese). Japan: East Japan Railway Company. Retrieved 6 September 2014. ^ 各駅の乗車人員　（2011年度） [Station passenger figures (Fiscal 2011)] (in Japanese). Japan: East Japan Railway Company. Retrieved 6 September 2014. ^ 駅別乗降人員順位表（2011年度1日平均） [Station passenger figures (Fiscal 2011)] (in Japanese). Japan: Tokyo Metro. Retrieved 6 September 2014. ^ 各駅の乗車人員　（2012年度） [Station passenger figures (Fiscal 2012)] (in Japanese). Japan: East Japan Railway Company. Retrieved 6 September 2014. ^ 各駅の乗降人員ランキング (2012年) [Station usage ranking (2012)] (in Japanese). Tokyo Metro. Retrieved 6 September 2014. ^ "Timetable | Keisei Bus". www.keiseibus.co.jp. Retrieved 2016-02-04. ^ "成田空港交通 / 仙台線". www.nariku.co.jp. Retrieved 2016-02-04. ^ "河口湖～西船橋・津田沼線 ※期間限定運行 - 富士急行バス". bus.fujikyu.co.jp. Retrieved 2016-02-04. ^ KCC. "成田空港交通 / 長野線". www.nariku.co.jp. Retrieved 2016-02-04. ^ "名古屋駅～お台場・「東京ディズニーリゾート®」（ファンタジアなごや号） ｜ 夜行高速バス ｜ 京成バス". www.keiseibus.co.jp. Retrieved 2016-02-04. ^ "奈良～横浜・上野・東京スカイツリータウン前・「東京ディズニーリゾート®」 ｜ 夜行高速バス ｜ 京成バス". www.keiseibus.co.jp. Retrieved 2016-02-04. ^ "神戸・大阪～横浜・東京駅・「東京ディズニーリゾート®」 ｜ 夜行高速バス ｜ 京成バス". www.keiseibus.co.jp. Retrieved 2016-02-04. ^ "成田空港交通 / 和歌山線". www.nariku.co.jp. Retrieved 2016-02-04. Wikimedia Commons has media related to Nishi-Funabashi Station.